Rembrandt van Rijn was born and lived for a long time in Leiden. There he studied at the university. Not finished training, Rembrandt sent to Amsterdam to learn the basics of painting. Went to the disciples of Peter Lastman. An early work of the artist, which deserves attention, is the painting “The Expulsion of Merchants from the Temple”, which Rembrandt wrote in his 20 years (1626). The canvas is distinguished by the presence of cold tones among the variegated colorful range. For a long time, the canvas was considered unreal, a fake, since the date and signature of the artist were made later with the help of old varnish. After research, which conducted, the signature was recognized by the author. Studies have shown that while working, Rembrandt changed a few details – he painted the hands of the characters that are in the foreground, and it was clear that he originally planned to depict differently, the money changer head had a different color, which was in the center was originally crimson, then blocked black color on a badly dried layer. The color of the money changer cap, as well as other places show us, the artist often did not wait for the previous layer to dry. 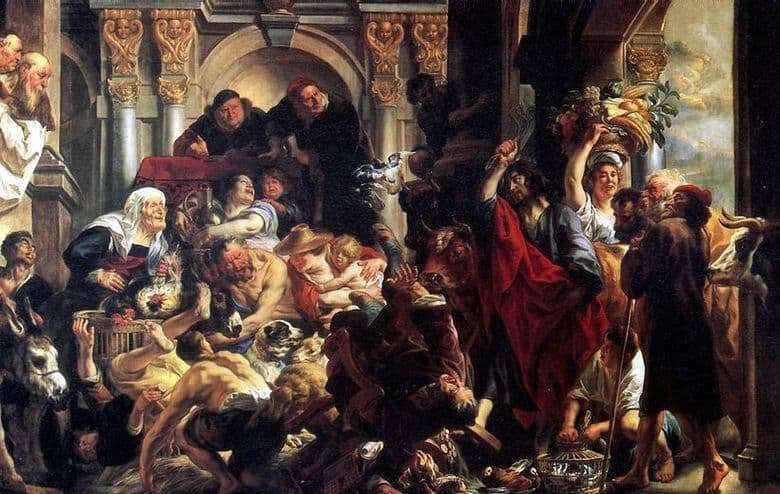 The plot of the picture tells us about how Christ in anger expels merchants and money changers from the temple. They are trying to flee by taking their money. The artist carefully tried to convey all the emotions, emphasizing their expression on the faces of money changers. Later, Rembrandt repeated his picture in an etching that he created in 1635. The painting “The Expulsion of Merchants from the Temple” was painted in oil on a parquet board. Board size – 43×32 cm.